Sr Marcelle Fluet was born in Lawrence Massachusetts, one of eleven children of Arthur Fluet and Emma Frechette, who were both born in the Province of Quebec in Canada. The Marist influence must have been strong in the Fluet family, as two of her brothers were Marist priests, Fr Philippe and Fr Henry, and the lone survivor of her siblings is Sr Martha Fluet smsm, who presently resides at St Patrick’s nursing home in Framingham. 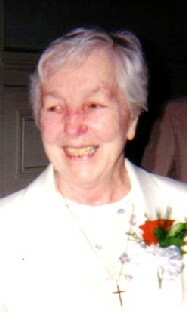 Marcelle entered the Marist Missionary Sisters on July 31st 1946 and made her first vows on February 2nd, 1949. She took the name Sr Mary Theresita and those who knew her during her years in Bougainville, Papua New Guinea, would remember her by that name. After profession she studied in Portland, Maine for a Teaching Certificate for Primary Grades. In 1952 she was missioned to Bougainville and spent the next 12 years teaching in Turiboiru and then Monoitu. In 1964 Sister was called back to Bedford, Massachusetts, to the “Second Novitiate” – a time of spiritual renewal. She then returned to Bougainville and continued teaching in Tearouki, Monoitu, Tunuru and Tubiana, Kieta. “I was never stationed with Marcie. In those days she was known as Sr. Theresita. She was a teacher and one of the younger lively sisters. If you were young and lively you usually were stationed on the west coast of Bougainville. That was the coast that was called the “weather coast” and meant that you were in very isolated places, very hard to reach and usually in a community of just 2 sisters. But that did not seem to be a problem for her. After a six-year term as the Superior General of the Sisters of Nazareth in Bougainville (1972-76), Sr Marcie returned to the USA for a home visit, and was soon granted compassionate leave to care for some family members who needed her help in Lawrence, MA. A year later she was in Waltham looking after our Sr Monique Hazebrook who was suffering the last stages of multiple sclerosis. Just a month after Sr Monique died in 1980, Sr Marcelle moved to Framingham, took a course to become a nurse’s aide, and soon began her long association with Bethany Health Care Center (a nursing home for the Sisters of St Joseph of Boston). Caring for the sick and the elderly became her mission for the next 32 years of her life. At various times over the years she cared for family members, for our Sisters, and for the many residents at Bethany. So many people have attested to the joyful spirit, the encouragement, and the love that she brought to people who were suffering. Both those who knew her years ago “in the missions” and those who have been with her recently, also attest to her “joie de vivre”: her readiness to respond to any invitation – whether just to go for a ride, or a picnic by the beach, or a trip to Dunkin Donuts. Srs Claire and Jhorna - who lived with her in the past few years, when she continued to volunteer at Bethany a couple of days a week, also tell us that she spent many hours in chapel when she was at home, reading the word of God, saying the rosary, just being aware of God’s love for her and her desire to respond. Her own end seemed to us to come suddenly – she was seriously ill for just a few weeks. But evidently the Lord was preparing a place for her. She told a couple of people that some weeks before she became very ill, at Communion time, she heard her name called and the Lord saying to her “Do not be afraid, I am with you.” She died at Bethany Health Care Centre, on the afternoon of September 20th surrounded during those last days by people who knew and loved her, including her nieces Marty and Doris, staff members and our Sisters. Sr Marcelle’s funeral was held on Tuesday, September 25th, and our Mission Hall in Waltham was overflowing with friends and family: Marist Fathers, clergy and parishioners from St George’s parish in Framingham, family members, neighbors, friends, Sisters and staff members from Bethany as well as SMSM from the different communities in MA. It was a beautiful Fall day - a day for celebration of a life so beautifully lived.